This product is available at Amazon.com, Amazon.co.uk, Amazon.de. 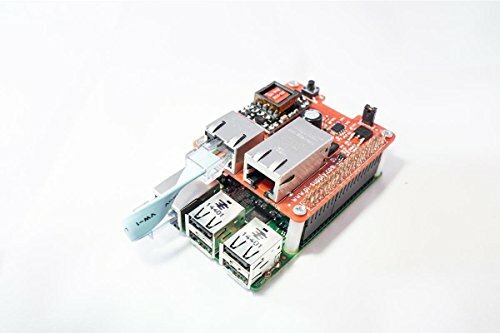 At amazon.co.uk you can purchase Pi PoE Switch HAT - Power over Ethernet for Raspberry Pi for only £34.99, which is 14% less than the cost in Amazon.de (€40.82). The lowest price of Pi PoE Switch HAT - Power over Ethernet für Raspberry Pi was obtained on 13 April 2019 3 h 02 min. The Pi PoE Switch HAT (HAT) expansion card is used to power the Raspberry Pi 3 by drawing power from a POE Ethernet cable. This card is stacked on the extension connector (GPIO) of the Raspberry Pi 3. The RPI is powered directly by the GPIO. The PoE Switch HAT card comes with a mini Ethernet cable. It connects to the RJ45 Ethernet jack to connect the Raspberry Pi 3 to the local network. The Pi PoE Switch HAT has been designed to leave the GPIO connector available for your mounting. To “inject” power into an Ethernet cable, you will need a splitter and at least a 6A Ethernet cable. Choose a higher category for a distance of more than 20 meters. Mini Ethernet cable to connect between the expansion card and the RPI to connect it to the local network.